Our decorating ideas are sure to make decorating your sailboat nursery theme smooth sailing all the way! When you are done, your baby's room will be an airy space that contains all the elements of the ocean and a carefree day sailing. A sailboat theme can be a nursery design for baby boys, a neutral theme or with a few pink accents, perfect for an ocean faring baby girl destined to enjoy the sun, surf and all the aquatic wonders that nature has to offer. 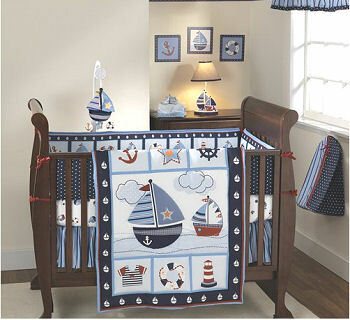 A crib comforter covered in sailboats, lighthouses and whales topped with a sailboat crib mobile will do the trick. This may be a good time to drop hints to the quilter in your family that a quilt with sailboats appliqued on the squares would be appreciated. A sailboat nursery theme should not be confused with a nautical nursery theme. Even though the two are somewhat similar, I consider a nautical theme to be a style of decor based on primary colors like bright red, navy blue and white. In comparison a sailboat nursery theme much more serene consisting of pictures of calm seas and the natural beauty of a Nantucket lifestyle. This baby boy's sailboat nursery features some adorable decorating ideas including boat theme baby bedding and a unique wall quote. When painting a background for a gender neutral or baby girl's room it may be best to choose another color other than blue even if there are touches of blue in the crib set. Stencil a border of sailboats or a mural of a clear sky on your ceiling. Your subject matter could be anything from a seascape, beach scenes to pictures of the family boat. If painting isn't your bag, sailboat graphics can be applied to your walls the easy way; by using removable vinyl wall clings, stickers and decals. 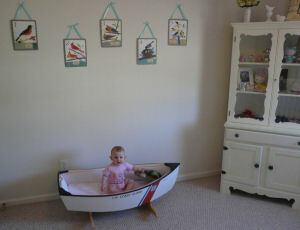 MORE Sailboat Nursery Theme decorating ideas! Suitable paint colors for the walls of a baby boy's sailboat room range from soft sky blues to turquoise and teal depending on the fabrics in your sailboat baby bedding set. The size of the nursery should have a bearing on how dark or light a blue will be best. For example, navy blue will make a small nursery seem even smaller and a light, pastel blue will push the walls back and give an illusion of space. A sailboat table lamp and other sailboat themed light fixtures and lamps are essential in setting the mood for your sailboat nursery theme. Table lamps decorated with anchors, lighthouses seagulls and starfish are readily available for your boating theme nursery. Visit some seaport antique stores for vintage boating items like an old ship's clock, an antique brass lamp to hang on some wall hooks, anything with a lighthouse theme. Group a collection of vintage boat lanterns on some wall shelves or a table. 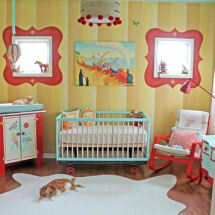 This collection can be used for a Nautical Nursery Theme as well. The model toy sailboats you built from a kit when you were a kid are perfect for this decor and can used alone or in a tablescape group. Crisp white baby nursery window treatments in an airy, cotton fabric offers the benefit of natural lighting and an unobstructed view of the beach. White wooden window shades with the wide slats would work as well. Several lengths of natural rope can be used at the top of your curtains as "rigging". Hanging the ropes as you would a draped scarf valance. Baby furniture in natural or a pickled whitewashed wood. Think sunwashed driftwood bleached by lying on the sand in the sun. Or buy a used white painted dresser, bookcase or armoire and distress it to look like a piece of typical beach house furniture. A sandy shade of carpet with a light ocean blue area rug by the crib bring back memories of a perfect day sailing. After you leave the nautical decorating ideas page on Unique Baby Gear Ideas please visit our home page to find more sailing themed items for your decorating projects. 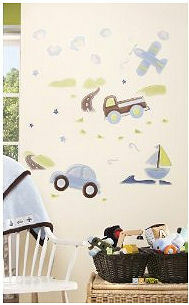 Do you have a great set of baby bedding or a picture of a nursery that you decorated with a sailboat theme? Share it!